Want to decorate in a new color scheme without going broke? Here are nine easy ideas to swap out the decor colors in your home without spending a lot. When we first moved in our house, we decorated with a lot of pieces we already had. We’d just renovated pretty much the entire house so we weren’t looking to spend much more. I’d always decorated with green (big surprise) and red, so I just kept doing what I’d been doing. I liked the red at first, and then after a while, I was just ready for a change. It seemed too dark of a color for our white and bright kitchen, and I felt like outside of the Christmas season, red seemed out of place. Decorating styles change and that’s totally okay – and part of the fun of it – but I decided I’d had enough red and wanted to swap it out for some blues and aquas. That being said, if you love red, decorate with it. Your home should be decorated however you like it – you live there! But it still begs the question, what to do when you want to decorate in a new color scheme when you don’t want to spend a lot of money. It didn’t happen overnight, but we made it work for us. I’m sharing our tips below. 1. Take the space back to a neutral base. This might mean you’re living with a beige, gray or white room for a while, and that’s okay. Decorating, especially on a budget, takes time. In our kitchen, I took out the red cushions, flowers, even small things like magnets and spatulas, and I immediately liked the kitchen a lot better. Bonus, if you’re in any of the local Facebook groups in your area, you can sell things like cushions and flowers and earn a little money to spend on new decor. I also kept a few red pieces specifically for the Christmas season since I knew I could easily add them to my ‘holiday decor’ collection without spending anything. 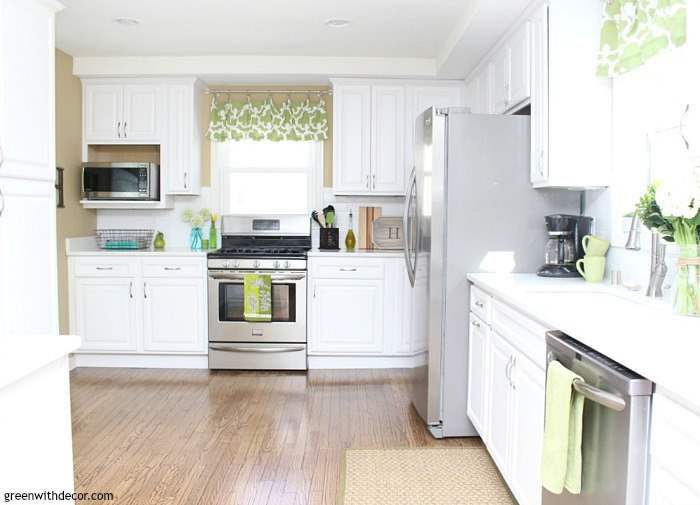 I love the green accents in our kitchen so those stayed, but there was a time before we added in the aqua and blue touches that our kitchen was just white and green. I knew it wasn’t ‘finished’, but sometimes it’s okay to just live in transition while you’re working on swapping decor colors. Once your space is back to neutral, think about what pieces you want to add back in. Below are a few ideas. Big surprise, right?! I will paint anything! It’s such a cheap, easy way to update your decor. I found this old cake platter at Goodwill and with a coat of blue paint, it was perfect as a little accent piece in a corner of the kitchen. You can paint pretty much any decor accent piece – picture frames, clocks, mirrors, lamps, jars, bottles, tile – the list goes on. Or if you’re swapping out decor in a bedroom or living room, paint a dresser, nightstand, TV stand, desk, coffee table, bookshelf, chair, even a fireplace. And think of it this way. If for some reason you don’t like the new paint color (hey sometimes it happens), you didn’t like the piece anyway, so just get rid of it. I painted an old metal vase the other day, and honestly I just still didn’t like it, so I tossed it. No big loss. I’m a huge fan of this. I just like swapping things out between rooms, and I keep extra decor in the basement. I pop down there whenever I want to look for something ‘new’ for a room. I bought a few glass vases at the Target dollar spot. We needed a few green cushions to replace the red ones in our kitchen. 5. Buy a bigger piece or two in your new accent color. Okay, I know this post is all about decorating on a budget. But sometimes when you do everything else in a room on a budget, give yourself permission to spend on a few key pieces you really want! I had my eye on this big aqua vase for SO long, I finally treated myself. Given its size, I knew it was an easy way to introduce aqua to the kitchen without having to buy a bunch of other pieces. Sometimes even one purchase like this can be an easy way to decorate in a new color scheme. In a living room, this might be an outdated couch. Think about slipcovers, too though. Even different colored blankets and pillows on top of a couch can make a difference. Our couch is dark, but it’s way too comfortable to get rid of and have just learned to decorate around it. 6. Accent colored pieces can be replaced with neutral pieces. This might sound obvious, but it took me a second to realize it. Don’t feel like you have to replace a colored piece for another colored piece. It takes the pressure off. We had a few red dishes that were usually out on the counter with fruit in them. Instead of replacing them with green or blue dishes, I used this little wood crate and wire basket for fruit, and it worked perfectly. 7. Think about glass bottles. This little green bottle is one of my faves. Plus we were going to buy the sauce it came in anyway, so I say this counts as free decor. 8. Don’t replace colored essentials, hide them. We have a few red spatulas, which we love for cooking. We used to have them out on display, and when I decided to decorate in a new color scheme in here, I just plopped them in a drawer. Our KitchenAid mixer is red, too. Yep, people warned us to get a neutral one when we were registering for wedding gifts, and yep, we ignored them. Yep, they were right. But guess what? It still works great and those things are expensive, so it hangs out in a cabinet behind a closed door. No one even knows that pop of red is back there. 9. Use books and magazines. I went through my huge pile of HGTV magazines and picked out the green, blue and aqua ones for the metal basket on the counter. I added a few of our cookbooks on top. Perfect way to add pops of color to the counter for free! Are you ready to decorate in a new color scheme? Have you been thinking about swapping out colors lately? Have any other tips for switching out colors? Lots of really practical ideas here! Thanks, Emily! Yes, magazine hoarding is definitely helpful for decorating!